There are times when the only way to fit a run into a busy day is to run to or from another activity. Running to or from work is one obvious choice for many people. It is a good use of time, but you usually need to carry gear, and for that a rucksack is essential. I’ve been using the same small, lightweight pack for years and years, and I’ve never found a good alternative. The Cloudburst 15 isn’t quite perfect – but it comes closer to my ‘old reliable’ than anything else I’ve seen. Cotswold Outdoor very kindly provided me with a review sample. A rucksack for running needs a couple of features as absolute essentials. It needs to fit snugly on the back having flexible, soft, non-chafing shoulder straps and a well fitted waist strap. You don’t want it bouncing about on your back in an irritating fashion, or digging into your shoulders. Compression is a good idea, as this lets you tighten the shell around its filling, so there’s no jangling about of the sack’s contents. I also prefer to have a little side pocket for odds and ends like money and keys too, though these things can be rolled up inside clothing if necessary. Finally you don’t want the sack to be too large or too small. It’s got to be an appropriate size for the amount of stuff you need to carry, and also not be too big for your back. The precise ideal dimensions will vary from person to person, but in general terms think of the size that’ll store a pair of shoes and the other clothes you wear on a working day plus one or two other small items rather than all that plus a load of shopping. You really don’t want to overweight the sack or carry too much weight – unless you are training for a mountain marathon of course! It doesn’t sound like a long wish list, but I’ve found it remarkably difficult to find rucksacks that meet these requirements. 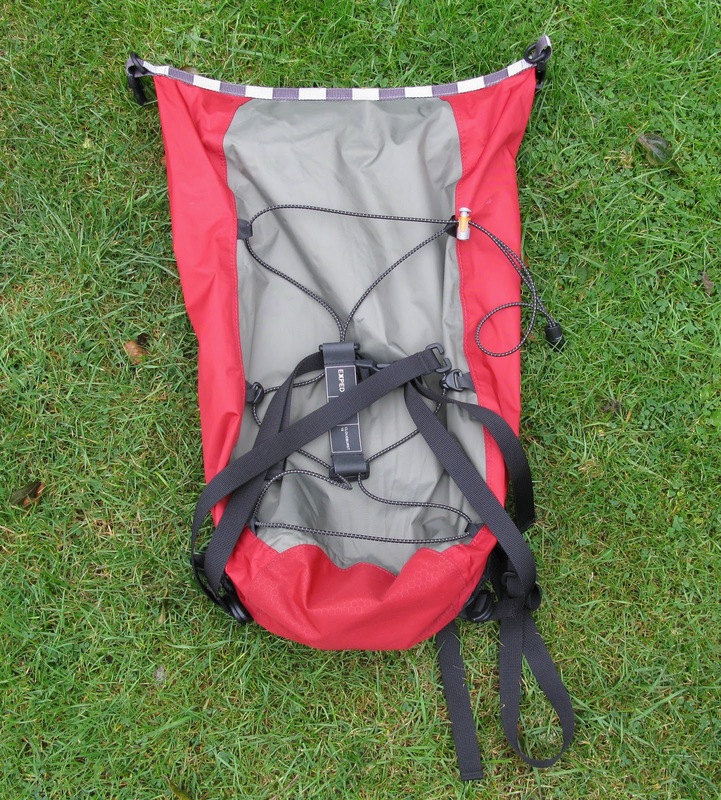 The Couldburst 15 is a 15 litre backpack which means it is small. I can get a complete change of clothes and a book in it with room to spare. It has compression bungee which means you can pull the sack round its contents to ensure there’s no jiggling about. The closure system is a simple strip that is held shut with a sewn in magnetic strip and then folded over onto itself two or three times before being clasped shut. I really like this system. It is very simple and fast, has a little flexibility in it so that you can roll two, three or four times depending on how full you have stuffed the sack, and you can anchor the closed strip ends under the compression cording. Zips break after time, this system feels like it’ll have a longer lifespan and it is perfectly secure. It is, in fact, the same tried and trusted system that manufacturer Exped uses on its drybags, stuff sacks and pack liners. There is a waist strap that has plenty of capacity for different waist sizes, and there is an adjustable chest strap with plenty of expandability for different sized and shaped people too. If I have any issues about the fit it is that the shoulder straps didn’t quite pull in tight enough for me. I’ve quite a narrow back, and smaller women reading this might have a similar problem. The average sized man won’t find this is an issue. 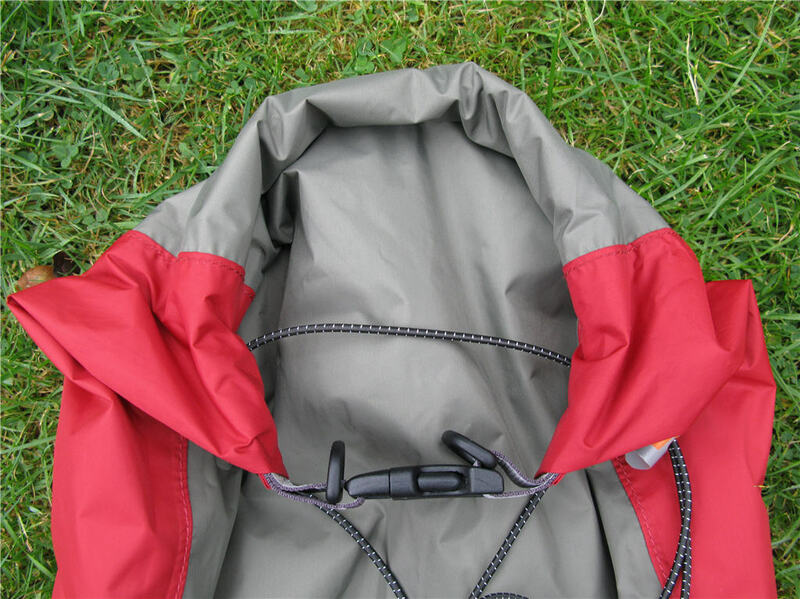 The shoulder straps have a generously long adjusting lanyard, and to prevent this hanging down over your bum and back thighs there’s a little clip you can use to anchor the end back up onto the shoulder strap itself. 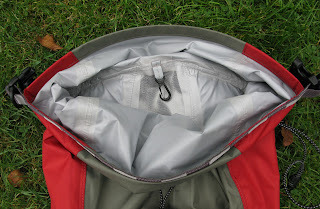 There is a hook just inside the top of the single main pocket onto which you can attach anything small and important. Keys are an obvious option. Here I hit my other main issue. I love the simple, single main pocket design, but I’d also really like a small inner pocket into which I could drop keys, money, and anything else small. What’s interesting about all this is that the Cloudburst 15 isn’t specifically designed for running. 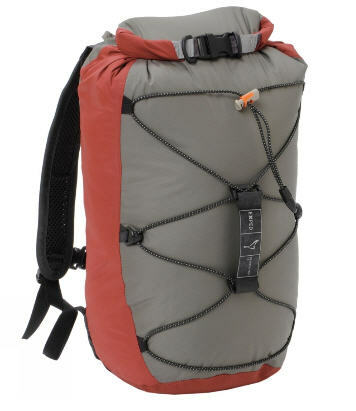 It is marketed as an ordinary daysack albeit one that is 100 percent waterproof. The fact that it works really well for me as a running rucksack is a great plus point but not one that maker Exped really pushes. Indeed, the Cloudburst 15 is the perfect size to carry my laptop and some paperwork and I’ve used it as a daysack almost as much as I’ve used it as a running rucksack during the testing period. In addition, you can remove the waist strap and chest strap, and that might make it more comfy as a daysack that’s not going to take much weight, as well as allowing it to double up (or actually, by now, we are on the triple up function) as a waterproof compression sack in a larger rucksack you might take on longer trips. Use it in this way, and, of course, it can fulfil the daysack / running rucksack roles too. There is a carrying handle at the top, which is a great little extra, and if you want to take the compression sack option then the transparent mesh on the back lets you get a peek at the contents without actually opening it up. 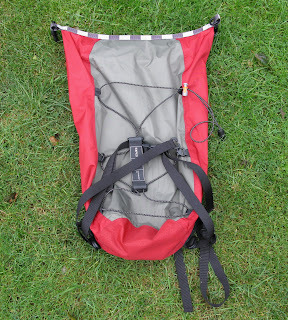 There are some annoyances with the Cloudburst 15 as a running rucksack. I’ve already whinged about the lack of an inner pocket. The nylon material from which the rucksack is made may well be waterproof, but it is not the best material to wear against your back – I found it a little sweaty. And because it is not a breathable fabric smelly running kit really did reek if stored in it for a trip home after a run. The saving grace here is that it is easy to turn the sack inside out in order to deal with odours. The Cloudburst 15 lacks a little finesse as a runner’s backpack, but then it is not made specifically for runners. Despite the niggles I found it did a really fine job. It is well sized, with good chest and waist straps and has enough capacity for a complete change of clothes and some extras. I love that it doubles up as a daysack, and the next time I go on a longer trip with all my kit in a bigger rucksack, I have a feeling it will come along. What’s really delightful about this multi-purpose rucksack is its price. At under £30 it is a steal.